Here in the United States, we have long been under the misimpression that the taxes paid by drivers – most notably the gas tax – cover the cost of building and keeping up our roads. And is there any doubt that those contributions have come with a claim of moral ownership? For decades, transportation policy has been shaped by the idea that drivers do their “fair share” to maintain the infrastructure they use, while other transportation users – those who ride transit, ride bicycles or walk – are little better than freeloaders. If you’ve ever wondered why some people get enraged at the so-called “diversion” of small amounts of gas tax revenue to transit, or are apoplectic over the dedication of a small amount of roadway space to bike lanes, or perceive efforts to make communities more walkable as a “war on cars,” it all comes down to the deeply ingrained belief that roads have been built solely by and for the exclusive benefit of motorists. A new report we at Frontier Group have co-authored with U.S. PIRG Education Fund, Who Pays for Roads?, explodes the “users pay” myth. Nearly half of the money now used to build, maintain and operate highways now comes from ordinary taxpayers – you and me – regardless of how much we drive. The amount of general tax revenue we spend on highways now exceeds government spending on transit and other forms of transportation. Far from “diverting” gas tax revenues to transit, we are instead diverting tens of billions dollars of general tax revenue each year to support highway use. And if one factors in hidden tax breaks for driving and the broad societal costs of car crashes and air pollution, the financial burden of highway use on the general public is even greater. Many smart and well-intentioned folks will look at these conclusions and diagnose the problem as a failure to ensure that motorists pay the full costs of driving. And I couldn’t agree more. But in the context of the current transportation funding debate, that advocacy often translates into support for raising the federal gas tax. And that’s where advocates of a more balanced, efficient and sustainable transportation system need to do some hard thinking. That’s because the “users pay” myth hasn’t just shaped how we allocate the costs of transportation, but it has also influenced how we spend transportation dollars. The federal transportation program is largely predicated on the notion that motorists – if not individually, then at least as residents of particular states or users of particular types of transportation infrastructure – “pay for what they get and get what they pay for” in gas taxes. There are exceptions to this – the 20 percent allocation of federal gas taxes to the Highway Trust Fund’s mass transit account is one – but they are clearly understood to be exceptions and the investments they support are often sold as bringing benefits to motorists. But from the former “equity bonuses” now baked into funding allocation formulas to the differential level of scrutiny given to highway versus transit projects, the “users pay” myth permeates transportation policy at the federal level. And that “users pay” framework has continued to shape transportation spending even as more and more of the actual financial burden of transportation has been shifted onto general taxpayers over the last decade. It is even worse in many states, which have statutory or constitutional prohibitions – some nearly a century old – against the use of gas tax revenue for anything other than roads and bridges. In those states, drivers may benefit from federal transportation funding that increasingly comes from general taxpayers, travel on local roads that have been paid for through general taxes, enjoy highway improvements paid for through local-option sales taxes, and have their fuel purchases exempted from the state general sales tax. But heaven forbid that a single penny of gas tax revenue be “diverted” for another use. Entertainments may be taxed; public houses may be taxed; racehorses may be taxed…and the yield devoted to the general revenue. But motorists are to be privileged for all time to have the whole yield of the tax on motors devoted to roads. Obviously this is all nonsense … Such contentions are absurd. Let’s be clear: there is a transportation funding crisis. It does need to be addressed. And raising the federal gas tax may be the most straightforward, most equitable solution to addressing it in the short term. But if, by some miracle, Congress should opt to increase the gas tax, it should not be celebrated as a victory. Rather, we should recognize that by doing so, we are merely keeping a moribund and wildly out-of-step federal transportation policy on life support for another few months or years. And we should then resolve to have the next national transportation debate be not about “plugging the funding gap” but about rethinking transportation for the 21st century. And if Congress, as appears likely, resorts to budgetary gimmicks or dips into the general fund once again to pay for transportation, we must make sure that the American people recognize that action as one more step toward shifting the “moral ownership” of our transportation system away from a single class of users and toward the place where it really belongs: with all of us. 1. This and other Churchill quotes come from the fascinating website ipayroadtax.com, which provides a through-the-looking-glass Brit’s-eye view of this set of issues. The history section is worth a read. On my local committee, with heavy representation of emergency responders, ped and cyclist advocates are told that they benefit from all these roads b/c the police and firefighters need them. How do I respond to that? How much of police and firefighters staff time is used for car crashes and pretty much another public handout to drivers? Very interesting analysis. This is such an important conversation to have. Unfortunately, I fear that people who say no to gas tax increases do not actually understand or acknowledge just how little those taxes go toward road maintenance and expansion. The gas tax should be devoted entirely to dealing with the pollution caused by burning gasoline. The majority of police time. Relatively little firefighter time. Firefighters can and should buy smaller fire trucks, though (separate ladder trucks and hose trucks would eliminate the need for the megatrucks which they claim need megawide roads). Yes. Or at least some way to tax driving. Emergency responders spend a ton of time stuck in car traffic. Imagine how much faster an ambulance can arrive at a patient and take them to the hospital if the roads are kept clear. Have you ever seen a protected bike lane double as an emergency vehicle lane? I have seen this in Manhattan and it’s a wonderful positive externality of creating good bike infrastructure. Gasoline use has significant direct and indirect negative externalities and we should tax its use to recover those costs. We should also index that tax to inflation, rather than using a fix cost per gallon which is near impossible to adjust over time. Additionally, driving itself has a different set of negative externalities, and until ultra-low mileage and alternative fuel source vehicles become common, taxing fuel is probably the simplest way to account for those externalities as well. Whether those tax revenues are allocated to the Highway Trust Fund or the General Fund is another matter entirely. Why conflate the two issues? All benefit from emergency vehicle access and freight, sure, but the total benefit of roads is not evenly distributed among drivers and non drivers. It’s also not evenly distributed just among drivers. Those who benefit more could be asked to pay a greater share of the costs. The question then is how much of the cost should be paid for out of user fees (gas/mile taxes, tolls, parking meters etc…), and non user fees (registration/license fees, property/income tax etc…) Since the general case is that user fees don’t cover a super majority of costs, there’s room to move towards a greater share covered by user fees without giving the much maligned upper/upper middle class pedestrian or cyclist a free ride at the expense of the ‘poor’ driver. Connecting tax collection with externalities is the exact problem which should be avoided. As a start, gas sale needs to be taxed on the same simple principles as any other commodity. If the consumption of the commodity has negative externalities, those should be recovered by taxing the producer/provider (oil companies) and let them pass it on to the consumer(or not) as they desire. What is to be done with the tax dollar has to be discussed in a broader scope irrespective of where it comes from. There will always be a push-pull between short-term benefits (better roads) and long term (better transit). But at least we’d have an equitable footing to start that discussion. This is an excellent point, and I don’t understand why driving enthusiasts don’t demand higher gas taxes, because higher taxes mean less crowded roads which mean more fun driving. Enthusiasts would be willing to pay the added cost, just as a bike enthusiast is willing to buy a more expensive bike than someone whose use is only utilitarian. I’m currently reading 20th Century Sprawl, and this same argument is mentioned without being fully explained. I don’t get it. If roadwork is underfunded by motorist fees and therefore draining the general fund, and extra gas tax revenue can only be used on roads, why couldn’t you raise funds with a gas tax, use that extra money to supplant money taken from the general fund, and then have more money in the general for non-road projects? Wouldn’t it just be easier to kill the gas tax and collect sales tax on gasoline and diesel fuel? That would automatically index it to inflation and make it a general revenue item, eliminating the argument that only motorists pay for the roads. With regard to the freight argument; subsidizing freight via interstate highways and cheap diesel has created huge price distortions in the US economy, particularly in the agricultural sector where long-distance farming is the norm. Less subsidies to freight transport would encourage local production of goods and services, including raising the value of arable land around cities for food production and thus hopefully preventing it from being devoured by more sprawl. Considering that a decent number of emergecy events are collisions, reduced collisions would actually reduce the need for EMS services. Of course, that’s a good way to get on their bad list too. Because the majority of road spending is on expansions. While expanding isn’t necessarily a problem, it often occurs even while regular maintenance is neglected. With that in mind, the likelihood that the increased gas tax money would be to cover maintenance instead of expansions is dubious. In other words, the subsidy wouldn’t end. 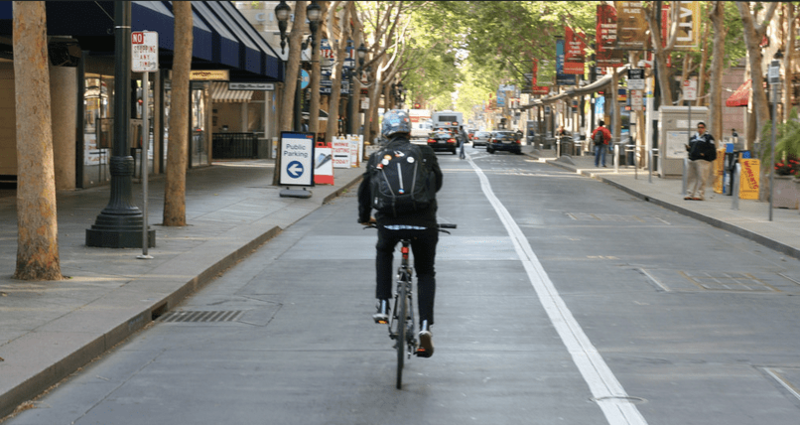 1) If “city” streets are to be used by all modes of transportation then to some extent it makes sense that the revenue for their construction and maintenance comes from property tax, sales tax, etc, with the caveat that they are designed to be inclusive, using complete streets guidelines for example. My views on this point are not too firm. 2) If the federal government needs funds to support highway and interstate construction, then the gas tax would be the best existing methods of applying a user tax, right? Whether you could tax gas without negatively impacting people’s ability to pay for nearly everything is another point. 3) Finally, in my experience, motorists, who are able to shut down even the best bicycle and pedestrian plans at community meetings, already do claim a “moral ownership” of the roads. Therefore, the goal here should be to come up with cool graphics that drive the “Who pays for roads?” point home so that even motorists, who find it hard to read speed limit signs, can understand. Mostly, I think it’s time to put to rest the dream of being able to get in your car in the garage and then drive it all the way to the parking spot in front of the restaurant. A good city is a place you don’t want to leave. No, gas taxes are not the right solution. TOLLS are the right solution. Speed-based tolls, specifically. Abolish speeding tickets on freeways. Then abolish freeways. Turn them all into turnpikes. Track people’s speed and charge tolls on a sliding scale. At a minimum, every urban highway should earn enough to pay for its own upkeep and to subsidize mass transit. No, because “20 mpg city, 25 mpg highway”. Gasoline engines operate more efficiently at high speeds. We need a system that charges drivers *more* to use expensive high-speed roads, not less. If that was the case, why are some states proposing changing from sales to excise taxes? Could it have to do with the plummeting price of fuel since July? Since the Highway Trust Fund has FOR YEARS been operating at a deficit – meaning the gas tax has NOT covered expenditures and the difference has been made up by GENERAL REVENUE diverted to the Highway Trust Fund, that ‘moral high ground’ no longer exists. If Pols Won’t Raise the Gas Tax, How Else Will They Fund Transportation?